She’s Dynamic, Engaging, Substantive, Magnetic, Purposeful. Blazing the trail, she guides others to take action for breaking through boundaries; achieving higher goals & creating a scalable, profitable business with peace of mind. An entrepreneur since the age of 9, she now is the founder of www.SweetMarketingSolutions.com , www.ThriveRightConsulting.com and www.3ReelFilms.com. Sweet has distinguished herself by breaking boundaries in body, mind, and business. 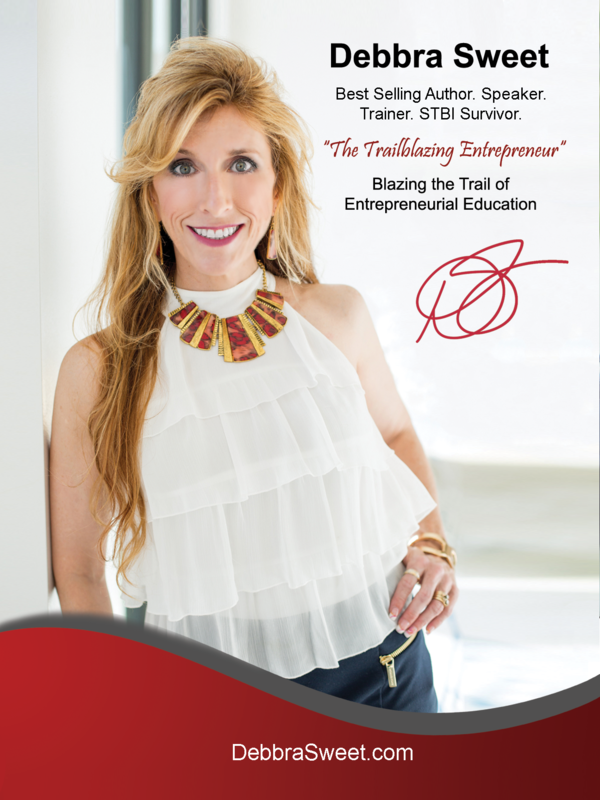 Blazing the trail with Entrepreneurial Leadership Education, Debbra draws from decades of hands on entrepreneurial leadership experience along with overcoming a profound personal traumatic experience. She expertly inspires, motivates, and better trains business owners how to effectively attract consistent clients, stabilize revenues and scale revenues with peace of mind and ROI. She pulls from her highly creative side as a musician and writer, blends that thinking with time in the corporate arena, along with decades of working with family owned businesses and masterfully guides others to take action for breaking through boundaries. She helps others clear the clutter of their heart to uncover their true potential and is the bridge that brings concept into reality! Debbra empowers her audience to light their fire of passion, get excited around opportunity and surrounds them with resources so they have the confidence to finally take action and make achieving goals a reality. And… she does this with complete transparency. She shares her triumphs and tragedy’s. She is inspiration to thousands that you CAN overcome anything & achieve the goals you take action on! Her innovative and proven Trademark Talk “Gear Up! Kickstart Your Business Growth to Master the Stages of Entrepreneurship is based on her trailblazing STEP UP Method; empowering you to Bust Through Status Quo, Rock Your Results & Master the Stages of Entrepreneurship! Moving people through change takes more than just inspiration. It’s more than just motivation. It’s the ability to connect with a person and engage them to make a commitment to themselves to follow through on their desire. A believer that change and growth on a larger scale, starts first with the individual, Debbra Sweet is an advocate for the power and potential of human capital. She is a living example of the unlimited creativity of mind, the resilience of the physical body and emotional spirit– and a supporter of systems for accountability that tie it all together. As an agent of change- her focus is single; to help others produce amazing results. Debbra’s keen eye and gift of precision inspires creativity and innovation, making them work together with proven systems for success. Her STEP UP Method helps bring clarity to what needs to be done to improve in order to achieve the results her clients are seeking. She perceives all the pieces she is working with, how they fit together to make a perfect whole. Then, she has a profound, tactful, mindful and unexpected way of streamlining things to make it so others can reproduce her practical solutions in a cost effective manner. She will shed light on things that you have never even thought of! Debbra’s energy and mastery of the subject matter and material shows through when she delivers her message with heart and confidence. Her desire to perform at a high level of excellence exceeds the expectations of those that work with her. Call Debbra Sweet Now (888) SWEET-85 (888-793-3885) to schedule her for your event or contact her online to set a private consultation about the goals you need to achieve.